You may be surprised to read this story starts at the beginning of the worst recession in recent history. During a period when the construction industry was in rapid decline, Jamie Barret and Chris Moss recognised the need for a professional service provider to the industry that could do things differently. 2007 saw the creation of Evolution5, offering project management, cost management and construction management services. Despite starting out during the global financial crisis they have grown year on year ever since. The founding values of the company – passion, responsibility, honesty, achievement and contribution remain at the core of the company’s ethos and drive all of their activities. By providing services tailored precisely to the needs of their clients, they deliver outstanding customer satisfaction that boasts a high level of repeat business as a result. Jamie and Chris’s passion is the construction industry. Jamie is now a trustee of the Chartered Institute of Building and Chris works closely with local HE teams to improve the perception of construction as a career choice. Not afraid to roll up their sleeves and get on site, Jamie and Chris work with an open door policy and are regular workers on their clients’ projects. Their success has not only come from their passion and drive but also through referrals from their customers. 84% of projects in the last twelve months have come from past customers! Always looking for constructive feedback and new ways to improve, every completed job is sent a customer satisfaction survey. 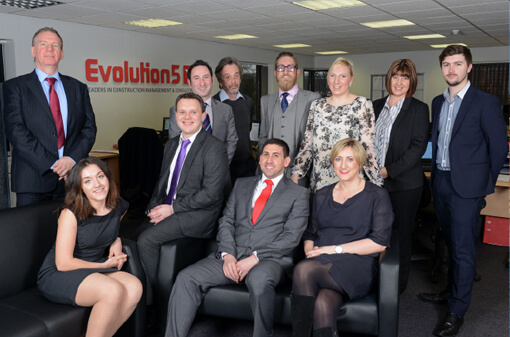 The past 12 months has seen Evolution5 achieve a 100% satisfaction rating and a near perfect 99.4% since 2007. This success and natural growth saw an increased strain on the small HR consultancy business they had taken on board when they were created. Their daily requirements and demands had started to outgrow their current provider’s capacity and it was becoming evident that there was a clear need to gain increased levels of support from a business with the resources to match their expectations. Since joining Peninsula, they have gained advice and guidance on a variety of topics ranging from, how to provide additional benefits such as health insurance or training fees to more complex and serious issues like redundancy. Peninsula has provided Evolution5 with its own fully functioning HR department and EAP (Employee Assistance Programme) support service. An EAP allows members of staff to have free confidential advice when any of life’s stresses are becoming a struggle. The highly popular Essentials Plus package has provided them with the freedom and confidence to focus on the growth of their business and allowing them to become even more successful. When asked what stands out about the Peninsula service Evolution5 said “Friendly, helpful staff who feel ‘in touch’ with the challenges we face being a relatively young SME and the importance of dealing with issues in a pragmatic way, which aligns with our core values. Coupled with excellent response times our decision to engage Peninsula has been confirmed as a positive step“.